I forgot to random dozen! Cruise by Lidna's to check it out! 1. If you could master one sport, what would it be? 2. When you make a major purchase, do you go with your gut instinct, or do you do research to make an informed decision? i don't often make major purchases. but the last one i made was definitely a spur of the moment deal. 3. There is an old kids' game that says you can find out what your movie star name would be by using your middle name as your first name and the name of the street you grew up on as your last. What is your movie star name? 4. Would you rather give up your favorite music or your favorite food? favorite food. i need to listen to music to alter my mood since i can't be a pothead anymore. 5. There are two types of banana preferences. One is pristine yellow, almost to the point of being green; the other is spotty and more ripe. Which is your preference? i would lean toward the spotty type. 6. Your favorite tree is? 7. On a scale of 1-10, how tech savvy are you? i would say a low seven. 8. Has H1N1 touched your family? 9. Are you an analytical person, or do you just accept things the way they are without questioning or scrutinizing? i cant answer without knowing the true intent of the question. do you think i'm dumb or something? 10. Is your personality more like that of a dog, cat, or Koala? i am more like an aggressive dog. bite lads, bite! 11. Do you keep in touch with friends you made years ago? not so much any more, only one or two. 12. You are checking out at a grocery store. In the express lane, there are more people than the regular lanes, but of course, their load is less than those in the regular lanes. Which lane do you choose (assuming you qualify for the express lane) and why? i choose any line that seems to be moving. 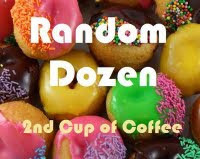 The next Random Dozen is up NOW and we're supposed to post it tomorrow. Mine is on autopilot for midnight! #9 proved your answer to #10 -- and I would so love to see you in plaid golf shorts buttoned at the knee, an Alligator polo shirt and matching Tam. I would not, however, stand within swinging distance of your club! Really? You were named after the street you grew up on? 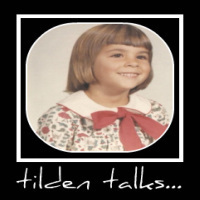 Turn left on Tilden?